For more than two decades Cameroon has been experiencing serious challenges with regards to infection prevention and the fight against epidemics. For more than two decades Cameroon has been experiencing serious challenges with regards to infection prevention and the fight against epidemics. The resistance and refusal of vaccines by the populations has marred the efficiency and effectiveness of vaccination against Measles and Poliomyelitis especially in the North West Region, aggravated by stock outs of BCG in the Northern and Centre Regions of the country. 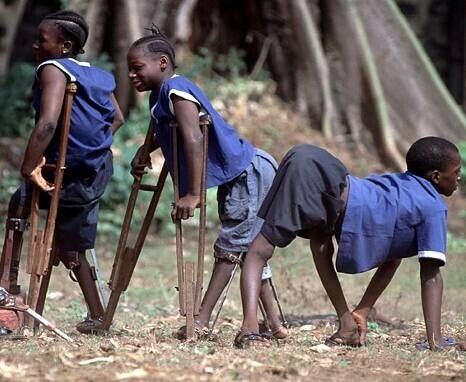 It would be amazing to make a brief appraisal of the failures and successes of the National Polio Vaccination campaign in the North West Region of Cameroon. Take a look at the following pictures. 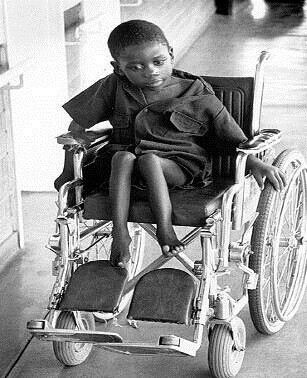 NB: Pictures 1 and 2: The devasting effects of polio still noticed in some remote and very poorly accessed villages. Picture 3: Some of these orthopaedic anomalies are being provided supportive physiotherapy by the use of wooden crutches in a Catholic Health Centre at Mambu-Bafut in the North West Region of Cameroon. In 1990 the North West population boycotted the Tetanus Toxoid vaccination campaign for women of childbearing age intended to fight against neonatal tetanus. This was motivated by political reasons and misconceptions that the Tetanus Toxoid was meant to render the female population of the province infertile as a means of reducing the population of the opposition political parties. This year, November 2015, a boycott has been staged against the testing of the Ebola Trial Vaccine virtually for the same reasons. In Bamenda 171 clients had already been scrupulously screened and counseled before being vaccinated while in Yaoundé barely 8 clients had gone through the same process before the boycott was staged. Cameroon has not yet experienced any outbreak of Ebola Virus disease, but her closest neighbor Nigeria, has. Cameroon is strategically located in Africa with a geography and behavioral pattern that is very similar to all the other Ebola infected countries. Ebola viral disease, hitherto known as Ebola hemorrhagic fever, is a very severe, highly infectious (contagious) and fatal zoonotic illness in humans with a case fatality rate of about 90%. There is a lot of literature about this disease in various related domains but the most important component is how to handle and cope with it practically. Infected patients require intensive nursing and supportive care since as at now, there is neither a licensed specific treatment nor a vaccine for use on both humans and animals. This trial vaccine ought to be welcomed by everybody, after all the other existing vaccines passed through the same trial process and necessary modifications before being used today. The populations of the North West Region in particular and Cameroon in general therefore need a lot of Information and Education for Behavioral Change, counseling, informed consent, and responsible decision making in order to solve this very crucial problem. Surveillance of diseases of epidemic potential must be improved and uplifted considering the massive presence of fruit bats and wild animals in the communities. Author: Ndipowa James Attangeur Chimfutumba, MPH. HOD / Nursing, Cameroon Christian University, Bali.